STILL sweating after 45 minutes of sinew stretching football, Colin, his baseball cap on back to front, sits patiently on the edge of the table in the youth club he frequents. 17 years old and unemployed, he originates from Jamaica but hails from Harlesden, and when it comes to raving he "dont business". Any weekend will find him on the move in searching a party, anywhere from Harlesden to Harrow, Kensal Rise to Paddington. He prefers UK lovers rock to the majority of music from Jamaica. Opposite him sits Paul, similarly attired in a nylon anorak, complete with go-faster stripes down the sleeves arid a red baseball hat: sticksman chic. Also of Jamaican extraction, he talks rapidly as his accent shifts with the smoothness of a Rolls Royce gearbox from a London twang to "yard" talk and back again, concentrating his raving activities in the Ladbroke Grove and Hammersmith area, Paul mostly deals in lovers, but if it is going to be dub then it has to be the heaviest. What are the raving possibilities for black youth on a weekend? P: Not much really, only parties." P: "Phew, theres hardly any clubs open on a Saturday. All Nations, Bali Hai. But the clubs of today are too violent." P: "It depends. If you dress up hard with jewellery and things and theres a gang of boys from another area, theyll drape you up for it. Theyd kill a man for his jewellery." P:	"Blues aint really for the gal them." C: "Yeah, and I went to a blues where it was 20p for a cup of water and five for ice." P:	"Sticksman Hi-Fi did play at a blues, 50p to get in and not so steep on the drinks. When the old people have blues its out of order. They have a big 70p for a rum and black and thing. "Ive been to a couple of nice blues though, where they played pure lovers. At one there was two sounds playing but one was playing dub and the people never check it, so everybody left and went into the room where they were playing lovers rock." So what about this situation with the lovers rock versus dub scene? C: "A party is nothing without girls and the girls check for lovers." How do you rate the smaller party sounds? P: "Theyre alright, but it depends what kind of music theyre playing and how they mix it." C: "You cant start a party by playing lovers, so you play a little dub and a little soul." P: "Yeah, liven up the party and then buss the lovers when everybody get tired and hot." C: "Then you go into revival, thats whats coming up now, old lovers music. Sounds like Jealously, Caught You In A Lie." P: "The dub sounds cant do that. They cant go into revival, say a whole heaps of cuts to Nice Up The Dance. That would be their revival, to dub and dub and dub to death." C: "The party sounds, they look promotion from the girls. Like Sweet Harmony, theyre a hard party sound, and every time they play out girls come from all over." P: "Or Sticksman Hi-Fi from Acton, me a tell yuh." "You feeling sweet so move your feet, at the club; a special groove you won't feel blue, at the club; and the beat goes on and on, at the club. What would life be without the club? How could we live without the dub. The Phebes, the Cubies, you're bound to rock. Said what would life be like without the club?" What about the town hall dances with the top sounds? P: "That's for the Ras Tafari them, for the dub man them. I only bother with them if it's big like Shaka. That's the only time I go. They don't play lovers 'cause they're entertaining Rasta them. They're not entertaining the yout' them, maybe the rasta yout' but them nah entertain me. C: "I was chatting to this Rasta guy and he was telling me how dub gives him the vibes to dance. Lovers ain't got no vibes for him. Rastaman is the kind of person who'll dance by himself and feel high. P: "I met this toaster in Greensleeves (Shepherds Bush) the other day, he toasts with Barrington Levy. . . and he tells me say he is a Rasta, but when he goes to parties he doesnt want to hear dub, just lovers so he can rub gal. 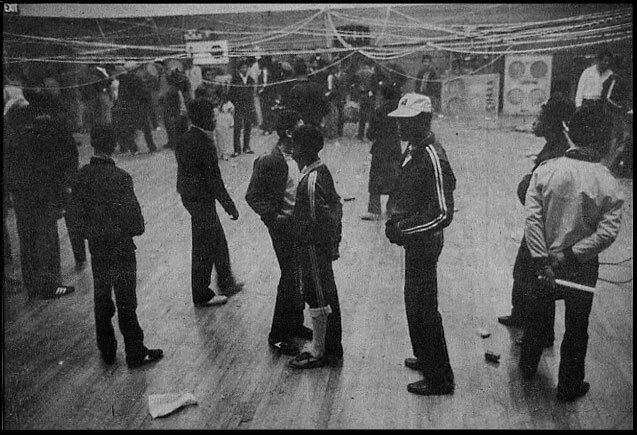 "People dont go into big halls like Acton Town Hall and rub; before they did, cause before people used to set their mind on it as one music (reggae). Lovers wasnt so hot then, but you used to have soft music and thats when Shaka and Bassa (Moa Anbessa) used to play it. People used to rub then, but now the sounds are just into dub." Shaka plays nothing but dub from the moment he strings up to when he signs off. P: "cause Shaka's the warrior. Hes showing people how hard he is." C: "To them, weight is the most important thing. If the bass comes out heavier than the other one they claim theyre the winner." So youre not interested in that side of sound? P: "Only if I feel for a little jump up and down. Like last Friday I did go down Phebes and did hear Shaka thump two rhythm, and when I got a little bored I jus went upstairs to the lovers." What about the big sounds? Do you reckon theyve got a future? P: "Theres only one sound thats got a future and thats Shaka, cause hes the one thats making the rhythm."